As expected, Stuart Le Noury added to his impressive list of wins in the annual Le Val des Terres Hill Climb when finishing just outside 5 minutes for the 815 metres course. Second man home was past winner Rob Elliott in 5.50. Leading woman Donna Allan improved on her previous best time by 12 seconds to take the womens trophy in 6.18, from Wendy Wilson and Jayne Le Noury. Third man home was Kevin Le Noury a few seconds behind Donna. Walked at one minute intervals in a time trial this event has been going since 1966 with stalwarts Mick Le Sauvage back in 6th place and Dave Dorey 8th place not missing many of them since then. At the other end of the scale Wendy Wilson and Kevin Allan were walking their first hill climb. Down on their previous best times Marie Macdonald and Olga Le Noury finished in 6.32 and 6.35 respectively. Jayne Le Noury, as consistent as ever finished one second quicker than in 2015. As expected the overall winner was Stuart Le Noury (centre) in 4.48, with his tenth Hill Climb win. Second quickest was course record holder Rob Elliott (Left), well behind in 5.48, followed by Kevin Le Noury ( right) in 6.05. Phil Lockwood, Mick Le Sauvage and Dave Dorey completed the event in 4th, 5th and 6th in the mens section. 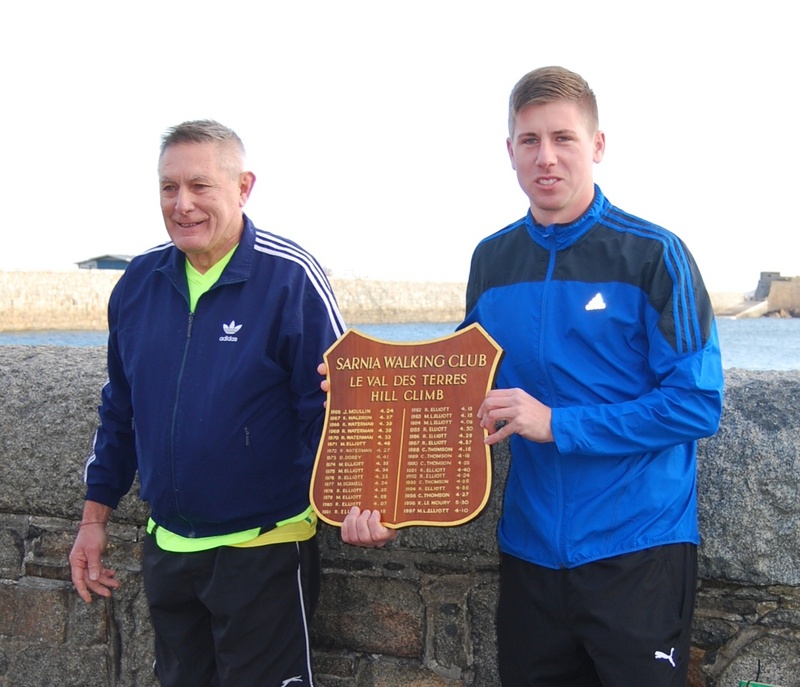 The next race is on Sunday December 18th at 9.30 am at the Imperial Hotel. Distance is three miles on the Rocquaine Circuit. Details from Jayne Le Noury, lenouryjedburgh@cwgsy.net. Stuart Le Noury added to his total of victories in the 50th annual hill climb up Le Val des Terres, beating Rob Elliott by 22 seconds. Walkers are set off up the hill at one minute intervals in a time trial up the 815 metres course. Third fastest male was Kevin Le Noury, only a second faster than young Alex Sinkevics. Walks of the day were to be found amongst the woman, with defending Champion Marie Macdonald, walking a new personal best time of 6.13 but having to see Olga Sinkevica race up the hill six seconds quicker in a winning time of 6.07. This time smashed her last years time by forty seconds. Marie and Mick Le Sauvage both improved their own age best times. The next walk is on Sunday December 27th at Rocquaine Bay over a hilly 3 miles course starting at 9.30 am. Details from Jayne Le Noiury, lenouryjedburgh@cwgsy.net. The winning streak of eight Le Val des Terres Hill Climbs wins by Stuart Le Noury was finally broken by his brother Jason as the younger brother walked the hill five seconds quicker in 4.50. Walkers are set off at one minute intervals against the clock and not in direct competition with each other and Stuart having walked up could only watch as Jason crossed the line that bit quicker. Third place went to Rob Elliott, with his quickest time for a good few years in 5.21. Womens champion Karen Farman, walked ten seconds faster than winning in 2013 with 6.26 but was beaten in 2014 by Marie Macdonald and her time of 6.15. Third place went to Olga Sinkevicha, walking her first race, with 6.47, just ahead of Kay Coulson, who set a new personal best time of 6.51. 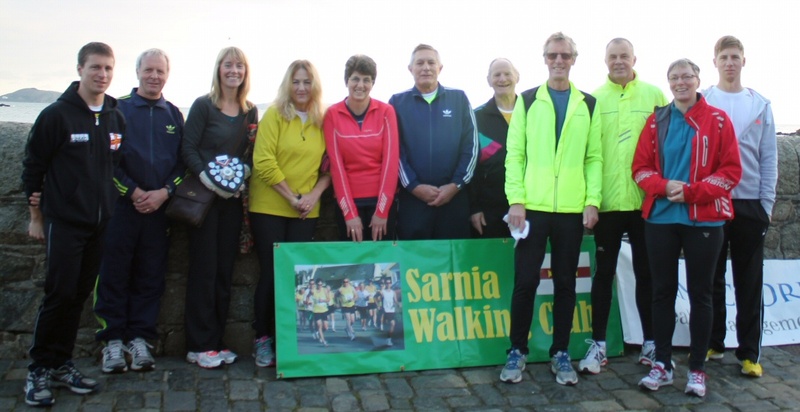 The race marked the 50th anniversary of the Sarnia Walking Clubs formation back in 1964, with the annual hill climb race for the Rob Waterman Shield starting a few years later. The next walk is on Sunday December 28th over a distance of 3 miles on the new Rocquaine Bay Circuit starting at 9.30 am. Details from Jayne Le Noury lenouryjedburgh@cwgsy.net. All smiles after the event. Photo taken by passing runner! Left to right, Stuart Le Noury, Kevin Le Noury, Karen Farman, Rose Druckes, Jayne Le Noury, Dave Dorey, Mick Le Sauvage, Terry Bates, Rob Elliott, Kay Coulson and Jason Le Noury. Le Val des Terres 815 metres. Stuart Le Noury was the quickest walker up the Val des Terres in the Canaccord Genuity Wealth Management Hill Climb for the eighth consecutive year. 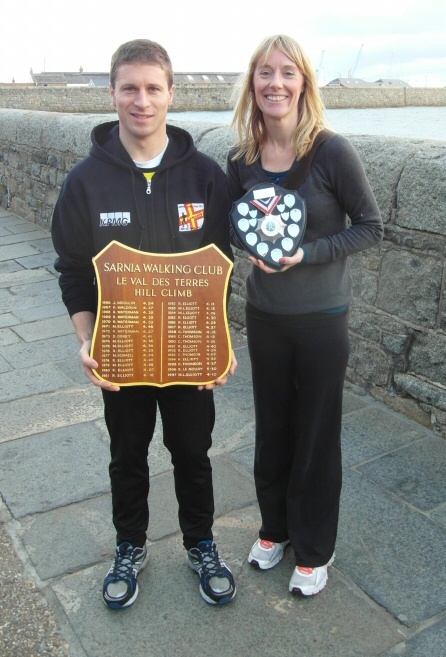 He walked the 815 metres in 4.43 to regain the Rob Waterman Shield for the fastest male walker. He was three seconds ahead of brother Jason Le Noury`s 4.46, whose effort was walked a few minutes later. 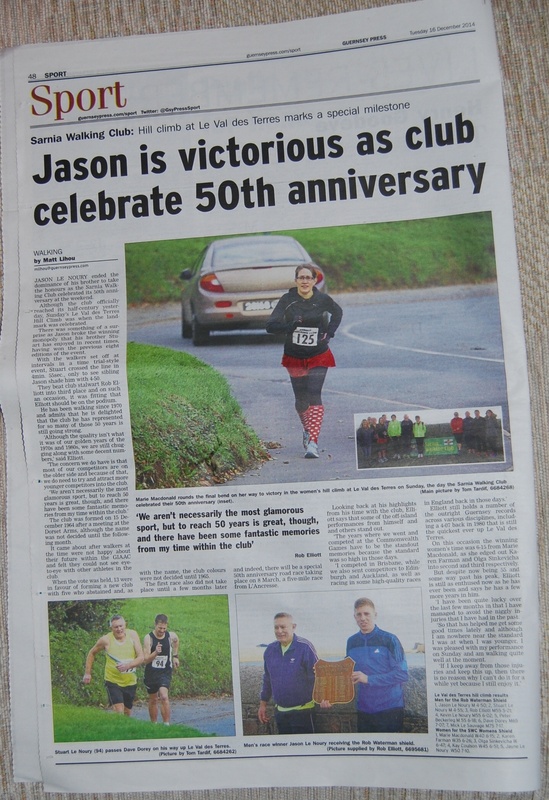 Jason knocked nine seconds off his best time set back in 2008. Walkers are set off at one minute intervals to tackle the climb in a time trial event. Third fastest was Terry Bates in 5.39 in his final race in Guernsey before moving back to the Isle of Man after living here for 10 years. An after race breakfast was held at the Half Moon, courtesy of Terry, who we look forward to seeing again when visiting Guernsey in the future. Rob Elliott, the hill climb record holder at 4.07, finished in fourth just outside 6 minutes ahead of Kevin Le Noury. Rob was quite pleased to once again get the better of him in this event. Mick Le Sauvage broke his own M70 best time with a 7 minutes dead clocking, walking three seconds faster than his old M70 time of 7.03. Dave Dorey and John Dedman walked 7.08 and 7.24 respectively. Gordon Mercier, a stalwart runner for the GIAAC, now 55 years old had a go at his first race walk and even claimed to enjoy it! The surprise there is that this course is one of the hardest to do, even though it is a short distance. We look forward to him competing again. 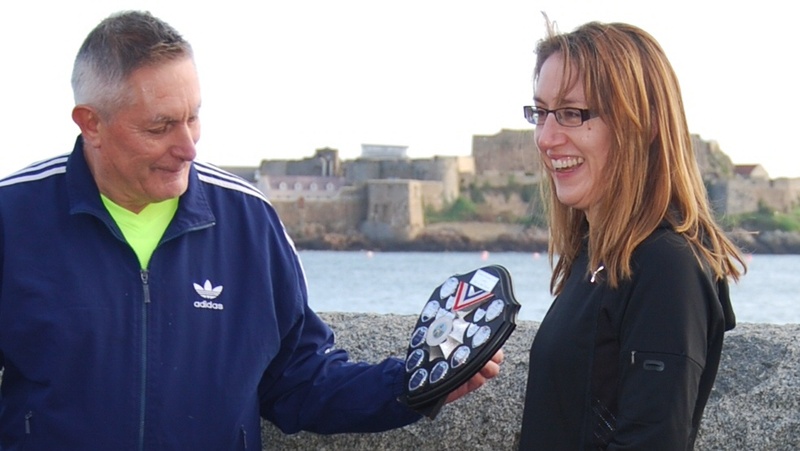 Karen Farman won the Womens Shield with a winning time of 6.36, ahead of Jayne Le Noury 6.55 and Kay Coulson 7.18. Fourth home was past winner Rose Druckes in 7.37. The next walk is on Sunday December 15th at 9.30 am at Footes Lane. The distance is 2,000 metres and is the fourth race in the Bob Wright Handicap Series. Details from Jayne Le Noury lenouryjedburgh@cwgsy.net.